“Charlene said she was astounded to visit Bishop’s, to spend a whole day here, without seeing anything to recognize Abenaki territory”, Taylor told POH. In response to her challenge, education students reached out to the Abenaki community in Odanak. Students visited the beautiful Musee des Abenakis, met Mathieu Obomsawim the curator and invited the wonderful Abenaki Wendat artists Christine Sioui-Wawanoloath (http://iosazaso.wixsite.com/sioui-wawanoloath) to collaborate with them in creating a collective permanent art installation to honour the Abenaki nation and Wabanaki Confederacy, the traditional stewards and protectors of this territory on which we are privileged to study at Bishop’s University. 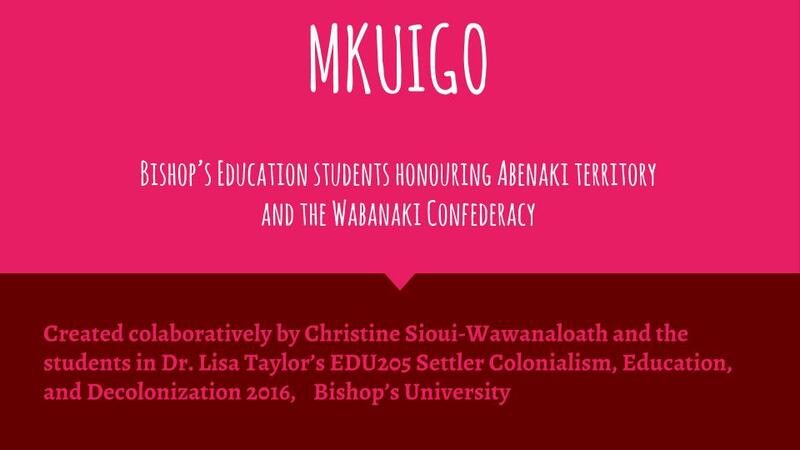 The students interviewed members of the campus community to gather thoughts on the practice of acknowledging Abenaki territory as it is just beginning to be embraced by Bishops. Thank you to Dr. Lisa Taylor for showcasing the wonderful progress your students are making in their reconciliation journey!